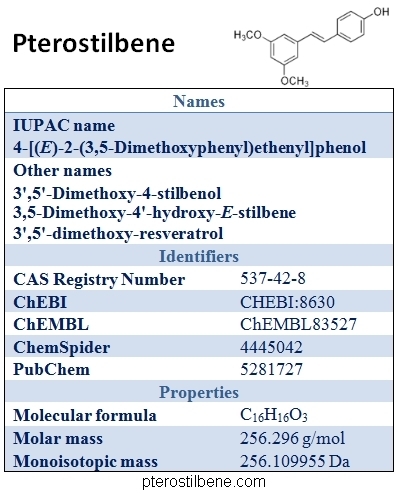 As discussed previously, resveratrol and pterostilbene are very similar molecules. They differ chiefly in their half-life and bioavailability in the body, with pterostilbene having a much longer half-life and therefore greater bioavailability and activity in the body. Pterostilbene is also a better SIRT1 activator. However, when taken together, the two stilbenoids seem to act synergistically, providing a greater antioxidant and healthful effect. Oxidative damage and the inflammation that it triggers plays a key role in many human diseases. Oxidative damage to the endothelial cells that line the blood vessels is thought to be very important in the development of arteriosclerosis. Oxidative damage worsens brain damage after a stroke or injury, and may be involved in processes leading to neurodegeneration. Antioxidants preferentially reactive with free radicals, destroying them and preventing them from causing cellular and tissue damage during oxidative stress. Because studies in humans and animals are expensive, time-consuming, sometimes ethically questionable, and often difficult to interpret, researchers have developed a number of in vitro laboratory studies to investigate the effects of free radicals and oxidative stress on cells. One popular assay measures levels of peroxidative damage to the lipids in the membranes of cells. Human erthryocytes (red blood cells) are the cells of choice, being widely available and also being particularly susceptible to free radical attacks due to the presence of redox active hemoglobin molecules. In these assays, the cells are exposed to oxidative damage from a chemical such as hydrogen peroxide, and then the levels of reactive thiobarbituric acid species created during lipid peroxidation are measured. Other measures of oxidative damage, such as hemolysis and depletion of glutathione, can also be performed. Glutathione is a natural antioxidant produced in human cells that plays a key role in protecting cells against free radicals. Depletion of glutathione means that the cell’s natural antioxidant protective systems have been overwhelmed. When human erthryocytes are exposed to oxidative stress in the presence of flavonols, the flavonols are able to provide significant protection against lipid peroxidation (LPO) and other signs of damage. Resveratrol, quercetin, and pterostilbene were all equally effective at protecting against hemolysis and depletion of glutathione. Both pterostilbene and quercetin provided significant protection against lipid peroxidation (with a better IC50 score for pterostilbene), but resveratrol alone did not provide significant protection against LPO. However, the combination of resveratrol and pterostilbene provided far more protection against lipid peroxidation than pterostilbene alone (1). At physiologically relevant concentrations, the combination of resveratrol and pterostilbene significantly reduced the amount of lipid peroxidative damage as compared to pterostilbene alone. This synergistic effect seems to be unique to reseveratrol and pterostilbene- other combinations of flavonols, such as pterostilbene and quercetin, and resveratrol and quercetin, did not exhibit any synergistic effect. In fact, at higher concentrations, combining quercetin with pterostilbene actually seemed to inhibit pterostilbene’s protective effect. Extracts of certain berries and grapes, which are rich in both resveratrol and pterostilbene, have been shown to have great antioxidant activity. The study by Mickstacaka et al. provides a rationale for this observed effect- a synergistic effect is at work. In summary, resveratrol and pterostilbene complement each other’s action as antioxidants, and appear to act synergistically to provide extra protection against free radical attack. Taken together, they may act synergistically to improve health on many different levels. Please direct or advise me what food/beverages to consume or pharmaceuticals to ask a physician recommended who ascribes to your laboratory findings. I have Parkinson’s disease and my internet research has made me aware that as you indicated: Oxidative stress causes cell aptosis/cell death due to signaling errors leading to phagocytosis and in the brain macrophages the scavenger cells lead to inflammation of neurons in the striatum including limbic structures such as the basal ganglia and hippocampal cells responsible for integration of movement and memory. Please help me stop or slow down this process through diet and/or medication. I am a retired and tired registered nurse. Thank you. Nina S.
Well, did you tried pterostilbene ? You can try to consume it as a dietary supplement ranging from 50 to 150mg per day. my aunt has a bad lung cancer. She’s doing chemoterapy, but I would like to help her chances of surviving adding pterostilbene. Which dosage would you recommend? She should try to consume pterostilbene 100 to 150mg a day (50mg twice a day with a meal). She can also add the others natural anti cancer such as luteolin, resveratrol, bromelain..